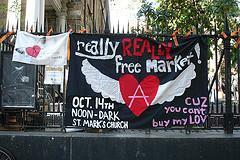 I helped to host the first Really Really Free Market (RRFM) in NYC on August 21st 2004. 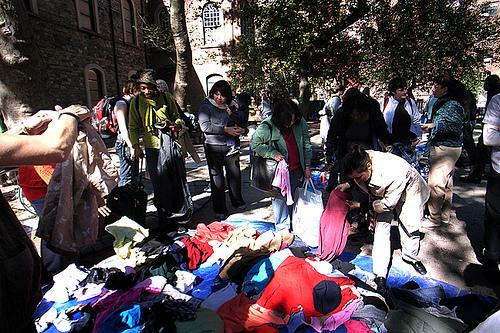 It was held outside at St. Mark's Church on the Bowery and attracted hundreds of participants. The Autonomous Space Collective which later became In Our Hearts hosted the first and in October 2nd RRFM to be held in NYC. The idea of the event was simple instead of a protest we were holding a demonstration. A demonstration in which we demonstrated what we we are for rather than always decrying what we were against. Our message is very simple: there is more than enough for everyone. During the course of the event participants would bring goods, services, art, food, and skills to share. 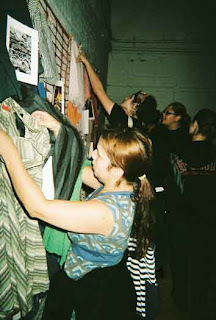 As a group we promoted the event and helped to coordinate the schedules we would have a number of simultaneous workshops, presentations or skill-shares happening around the space simultaneously. 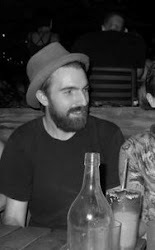 We also recruited and scheduled live music which meant anything from marching bands, to klezmer, folk, punk and hip-hop acts. 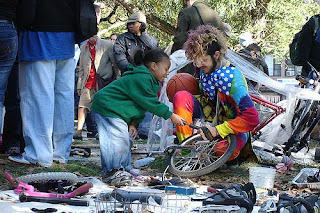 Other like minded groups like Time's Up!, Radical Reference, Freegan, the Freegan Bike Workshop, Freecycle and others regularly set up tables, promoted their organizations and shared food, clothing, or services. 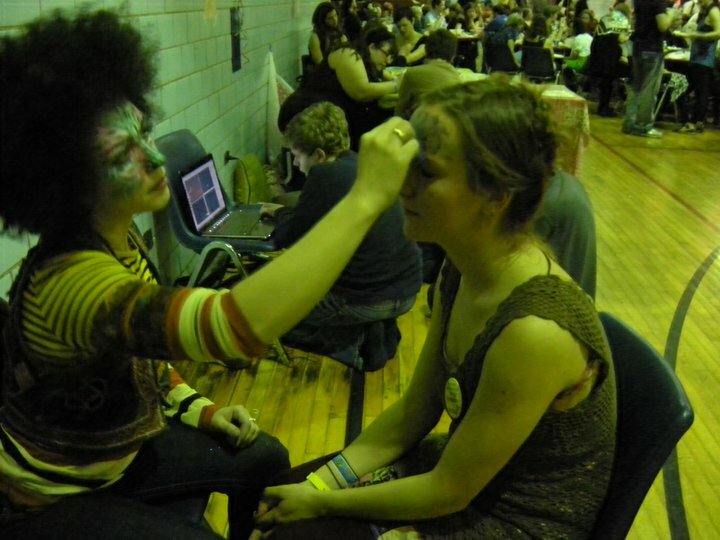 Individuals often shared massage, yoga, hairstyling, face painting (not just for kids,) and tax advice instruction or services. 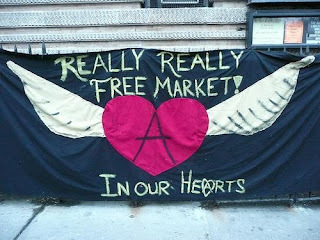 A free market was held on average once or twice per year until the Fall of 2008 when we made them monthly events. Unfortunately in the Winter of 2009 at least in part in due to internal issues withing the church St. Mark's decided they could no longer host the markets on such a regular basis. 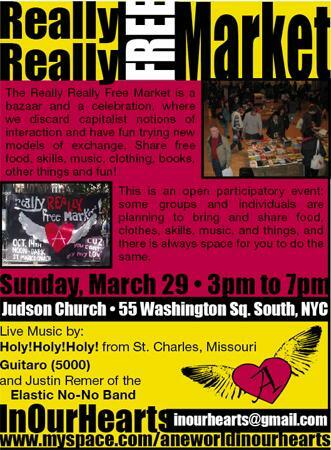 A number of publications reported on the possible end of the regular markets and as a result Judson Memorial Church offered us space to host the events. I coordinated between In Our Hearts and Judson and helped to organize the monthly events for the remainder of 2009.